Completely aside from the joy of not having to be blasted with heat from the oven, I think raw desserts have a deeper and more decadent flavor. For example, using cinnamon in a recipe. It tastes more prominent when it’s not baked and it’s still in raw form. This is all speculation and I might just be slightly crazy and there’s probably no difference but either way, no-oven desserts are always delightful to make. Since I can remember I have had this terrible sweet tooth—especially late at night, like right before bed time sweet tooth. Perhaps, it’s to balance my palette out after dinner or maybe I really do just have an addiction to sugar. Either way, I always allow myself a decadent treat in the evening. If there’s anything I never skip out on in this world, it’s dessert. That’s why tonight I made coconut almond energy bites with raw cocoa powder. 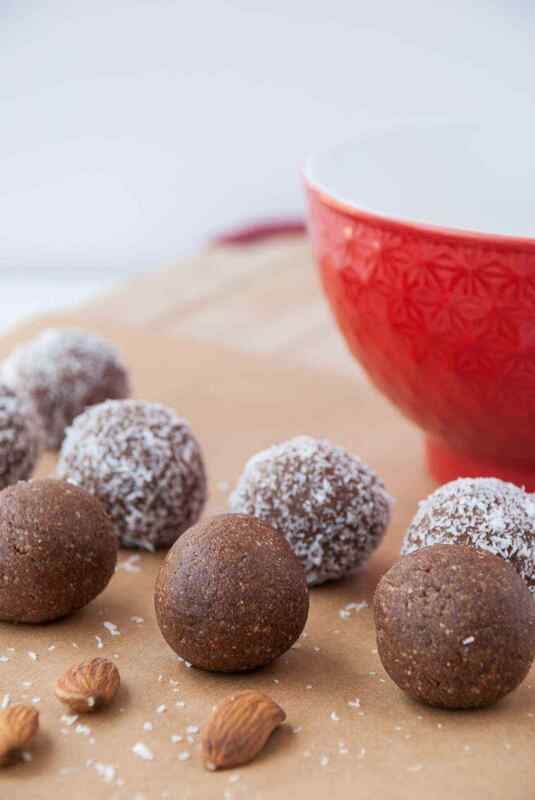 Basically, these are just super healthy, no bake, vegan, paleo and gluten free Almond Joys—only they taste about a million times better! These are sure to be loved by everyone and they are perfect for when that sweet craving hits. Not to mention, a quick little energy boost from the almonds and coconut to keep you fueled throughout the day. So let’s just forget about going to the grocery store for a candy bar that’s full of preservatives, processed sugar and lots of other things no one can pronounce. Instead, make these energy bites that take no longer that ten minutes from start to finish! 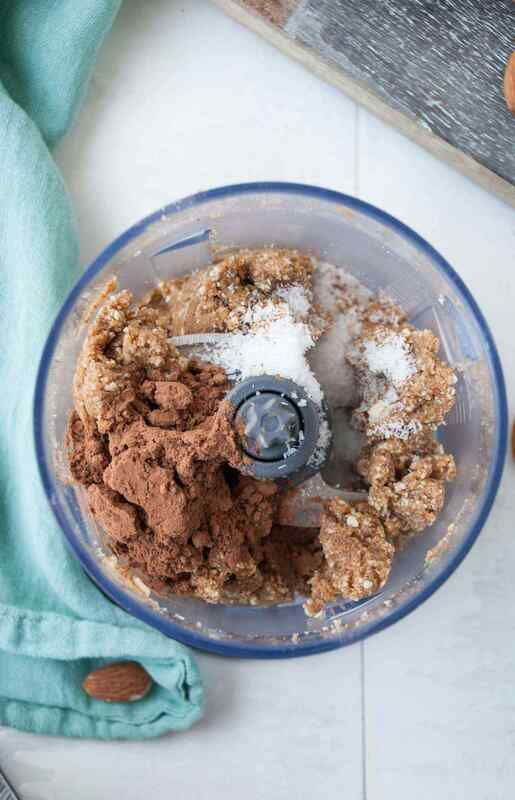 Thank goodness for the food processor—it’s dream for anyone that loves no bake desserts. Almost like magic, it quickly processes all your food together—I can’t imagine the healthy life without it. 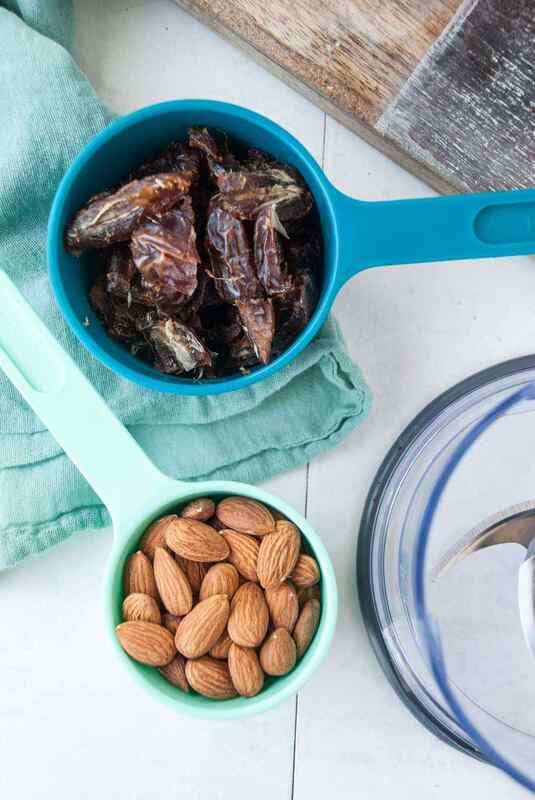 In just a few easy pulses of your food processor, you too can have these sinfully healthy, energy packed bites.